The Chicago Red Stars got back to winning ways thanks to a historic three-goal performance from Sam Kerr. The Red Stars defeated Sky Blue FC 3-1 at Yurcak Field in Week 15. The three points for the Red Stars briefly pushed them to second place in the standings and a 6-4-7 overall record with 25 points (but once Week 15 concluded Saturday night, the Red Stars were in fourth place). Sky Blue FC now hold the record for the longest winless streak in NWSL history at 14 games. Entering this match Sky Blue was tied with the 2013 Washington Spirit for having the longest winless streak. Sky Blue remain in last place in the standings at 0-11-3 and three points. Kerr became the first NWSL player to score three hat tricks. This is the 14th hat trick in league history. Saturday’s performance came nearly one year to the day of another memorable Kerr hat trick on the very same field. Last year, her three goal performance led her former team, Sky Blue FC, to a dramatic 3-2 comeback win over FC Kansas City. It was only fitting that the forward in her return to New Jersey scored a hat trick. Kerr’s Week 15 performance also pushed her to eight goals on the season to lead the league and she became the first NWSL player to score 50 career goals. Kerr scored her first goal of the night in the 40th minute. Red Stars goalkeeper Alyssa Naeher played a long service over Sky Blue FC’s backline into forward Alyssa Mautz. Mautz served a ball towards the top of the box to Kerr, who settled it and finished in the lower left corner for the 1-0 lead. It was Kerr again who doubled the Red Stars lead to start the second half. Yuki Nagasato played Kerr over the top from midfield and Kerr collected it and finished far post past Sky Blue FC goalkeeper Kailen Sheridan for the 2-0 lead. This goal marked the historic 50 goal mark for Kerr who became the first NWSL player to score 50 career goals. The 2017 NWSL Golden Boot and MVP winner didn’t stop there. In the 63rd minute she finished her third of the night. Nagasato played Kerr into space and Kerr finished in the left corner to extend her team’s lead to 3-0. Kerr finished the game with 10 shots with six on target. She also made three key passes on the night. Sky Blue got on the board in the 73rd minute off of a solid team build up that eventually resulted in forward Imani Dorsey scoring her first NWSL career goal. 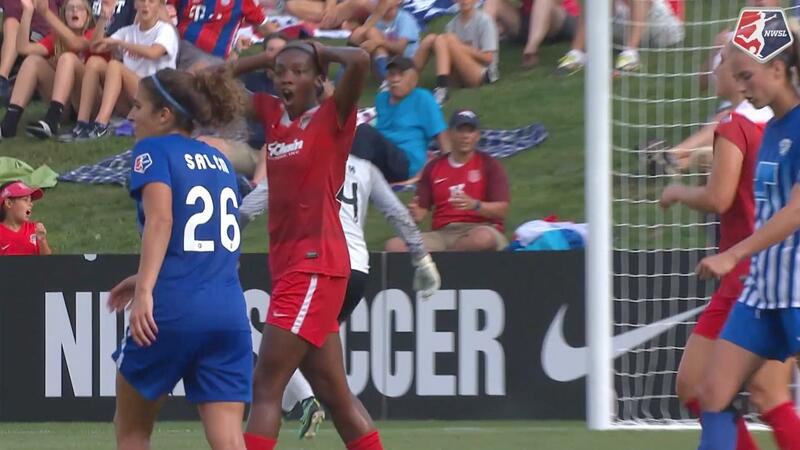 Carli Lloyd played Savannah McCaskill, who slipped in a pass to Dorsey in the box. Dorsey slotted it in to get her team on the scoreboard at home. The rookie finished the game with a team-high three shots and three on target. Sky Blue had nine shots and the Red Stars had 17. The Red Stars also had the better of the possession on the night with 56.5% to Sky Blue’s 43.5 %. This match up also continued the Red Stars all-time winning record over Sky Blue FC. Sky Blue has never defeated the Red Stars in all 14 meetings between the teams. Chicago has now won six times and the teams have played to a tie on eight occasions. Sky Blue will look for their first win of the season when they face the league-leading North Carolina Courage on Saturday in Week 16 action. The Red Stars will also return to play next Saturday when they host Seattle Reign FC. Match ends, Sky Blue 1, Chicago Red Stars 3. Second Half ends, Sky Blue 1, Chicago Red Stars 3. Substitution, Sky Blue. Katie Johnson replaces Imani Dorsey. Substitution, Chicago Red Stars. Rosie White replaces Yuki Nagasato. Attempt missed. McKenzie Meehan (Sky Blue) header from the centre of the box misses to the right. Assisted by Savannah McCaskill with a cross following a corner. Attempt saved. Carli Lloyd (Sky Blue) right footed shot from outside the box is saved in the bottom left corner. Substitution, Chicago Red Stars. Morgan Brian replaces Danielle Colaprico. Attempt missed. Janine Beckie (Sky Blue) right footed shot from outside the box is too high from a direct free kick. Substitution, Chicago Red Stars. Vanessa Di Bernardo replaces Michele Vasconcelos. Attempt saved. Casey Short (Chicago Red Stars) left footed shot from the left side of the box is saved in the centre of the goal. Assisted by Samantha Kerr. Goal! Sky Blue 1, Chicago Red Stars 3. Imani Dorsey (Sky Blue) right footed shot from the centre of the box to the centre of the goal. Assisted by Savannah McCaskill. Attempt saved. 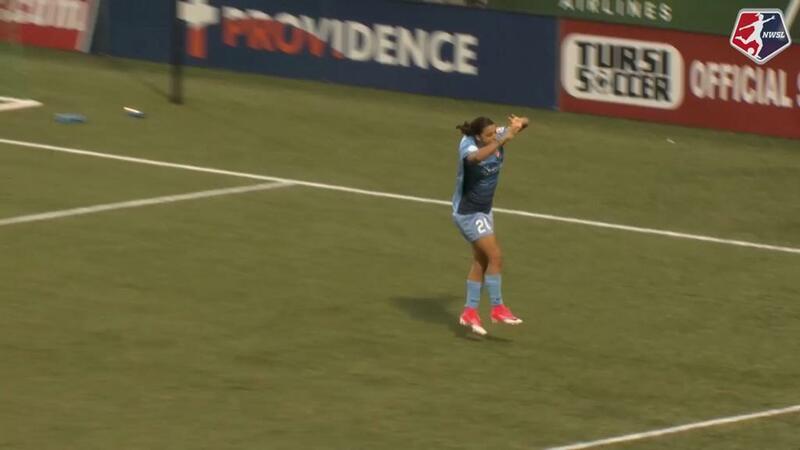 Carli Lloyd (Sky Blue) right footed shot from more than 40 yards on the right wing is saved in the top left corner. Attempt missed. 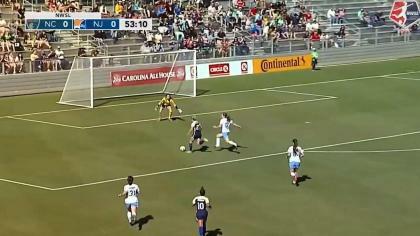 Carli Lloyd (Sky Blue) right footed shot from the centre of the box is too high. Assisted by Savannah McCaskill. Attempt missed. Madison Tiernan (Sky Blue) right footed shot from outside the box is high and wide to the right. Assisted by Janine Beckie. Attempt saved. Samantha Kerr (Chicago Red Stars) left footed shot from the left side of the box is saved in the bottom right corner. Assisted by Yuki Nagasato. Goal! Sky Blue 0, Chicago Red Stars 3. Samantha Kerr (Chicago Red Stars) right footed shot from the centre of the box to the bottom left corner. Assisted by Yuki Nagasato with a through ball. Attempt missed. Danielle Colaprico (Chicago Red Stars) right footed shot from outside the box is just a bit too high. Assisted by Yuki Nagasato. Attempt missed. Samantha Kerr (Chicago Red Stars) right footed shot from outside the box is close, but misses the top right corner. Assisted by Arin Gilliland. Goal! Sky Blue 0, Chicago Red Stars 2. Samantha Kerr (Chicago Red Stars) right footed shot from the right side of the box to the bottom left corner. Assisted by Yuki Nagasato. Second Half begins Sky Blue 0, Chicago Red Stars 1. First Half ends, Sky Blue 0, Chicago Red Stars 1. Attempt saved. Julie Ertz (Chicago Red Stars) right footed shot from the left side of the six yard box is saved in the centre of the goal. Assisted by Alyssa Mautz. Attempt missed. Alyssa Mautz (Chicago Red Stars) right footed shot from the centre of the box misses to the left. Assisted by Danielle Colaprico with a cross following a set piece situation. Foul by Janine Beckie (Sky Blue). Goal! Sky Blue 0, Chicago Red Stars 1. Samantha Kerr (Chicago Red Stars) right footed shot from outside the box to the bottom left corner. Assisted by Alyssa Mautz. Attempt missed. Michele Vasconcelos (Chicago Red Stars) right footed shot from the centre of the box is close, but misses to the left. Assisted by Samantha Kerr. Offside, Sky Blue. Carli Lloyd tries a through ball, but Shea Groom is caught offside. Attempt saved. Alyssa Mautz (Chicago Red Stars) left footed shot from outside the box is saved in the top right corner. Assisted by Yuki Nagasato. Shea Groom (Sky Blue) wins a free kick on the right wing. Nikki Stanton (Chicago Red Stars) wins a free kick on the left wing. Attempt saved. Yuki Nagasato (Chicago Red Stars) right footed shot from the centre of the box is saved in the centre of the goal. Assisted by Samantha Kerr with a through ball. Attempt blocked. Samantha Kerr (Chicago Red Stars) right footed shot from the centre of the box is blocked. Assisted by Michele Vasconcelos with a through ball. Attempt saved. Samantha Kerr (Chicago Red Stars) right footed shot from a difficult angle on the right is saved in the bottom left corner. Assisted by Arin Gilliland. Attempt saved. Samantha Kerr (Chicago Red Stars) right footed shot from the right side of the box is saved in the centre of the goal. Assisted by Alyssa Mautz. Attempt saved. Imani Dorsey (Sky Blue) right footed shot from the centre of the box is saved in the centre of the goal. Assisted by Carli Lloyd with a through ball. Corner, Chicago Red Stars. Conceded by Savannah McCaskill. Corner, Chicago Red Stars. Conceded by Dominique Richardson. Attempt missed. Samantha Kerr (Chicago Red Stars) right footed shot from the centre of the box is close, but misses to the right. Assisted by Alyssa Mautz with a cross. Attempt missed. Samantha Kerr (Chicago Red Stars) right footed shot from outside the box is close, but misses to the left. Assisted by Yuki Nagasato.